Ari Purhonen worked briefly as an architect before turning to sculpture in the mid 1980s. Some of his earliest pieces were kinetic sculptures that looked like wall drawings and suggested something between machine and beast. ‘Dreamtime adrenalin’ 1985 (AGNSW collection) is one of these playful, hybrid objects, made of cut-steel plates and shards of mirrored glass. Its three sections, or limbs, are articulated by two pins which enable them to move independently when hung on the wall. After this initial phase, he quickly refined his work into highly finished, often minimal forms. Including lenses and elements which recall surgical or laboratory instruments, these forms invariably suggested scientific solutions to imaginary problems. There is more than a hint of Marcel Duchamp in this machine world that threatens to evolve into animate life form. The machine may be a metaphor for aspects of human behaviour, such as the elaborate bachelor’s apparatus in Duchamp’s infamous ‘The large glass’. Cell has a passing affinity with another work by Duchamp, in which an object was hidden inside a ball of string and sealed between two plates of steel held by a bolt in each corner and forming a sealed cube. The object inside was to remain forever unknown to us. ‘Cell’ is a closed container also, its bars close enough to occlude a clear view of what is inside or of what lies beyond. Again like Duchamp, Purhonen’s title gives us many clues as to the different metaphorical possibilities of the work. It may at first seem like a mute, minimalist object. But a cell may be many things: a cage, a battery, the building blocks of life or a compartment in a honeycomb. The battery and the bees’ nest both have Beuysian connotations:1 Joseph Beuys saw the battery as a storage place for energy, as a generator and as a metaphor for creative life and history. These steel bars meticulously bolted at each juncture look somewhat like a voltaic cell and a bit like the secure cages placed around electricity substations. It appears to have some function but it frustrates our discovery of what this might be. Contrary to the minimalist ethos that asks us to accept sculpture as an abstract, self sufficient form, this cube keeps suggesting meaning beyond its material presence. 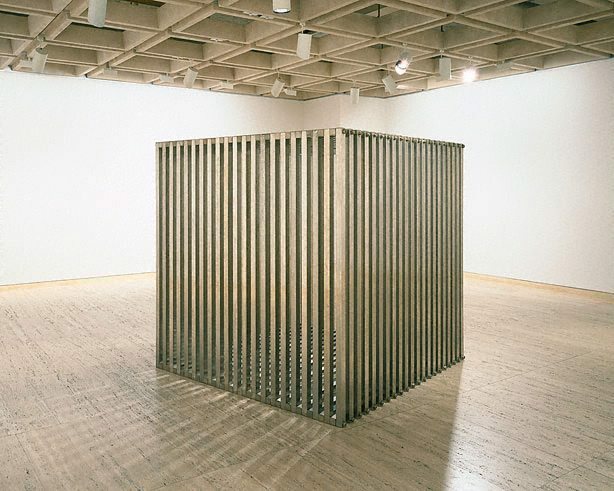 Could it be sheer coincidence that the work was first shown outside the AGNSW for Australian Perspecta 1991 on the same spot where the English performance artist Stuart Brisley occupied a cage-like structure in 1976 for the Biennale of Sydney? It is an elegant sculpture with every detail contributing to its necessary and sufficient material structure and yet is after all a hermetic cell, no way in and no way out. 1. Joseph Beuys, discussed in relation to Ute Klophaus, believed in an organic and bodily process of secretions that could produce a kind of sculpture. He also created batteries and imaginative machines that could generate current through the human body.